Thursday April 8th 1926 I did some wash for myself in AM. Went to the bank. Then phoned Mattie Stitt. She was home so I went out there to stay all night. 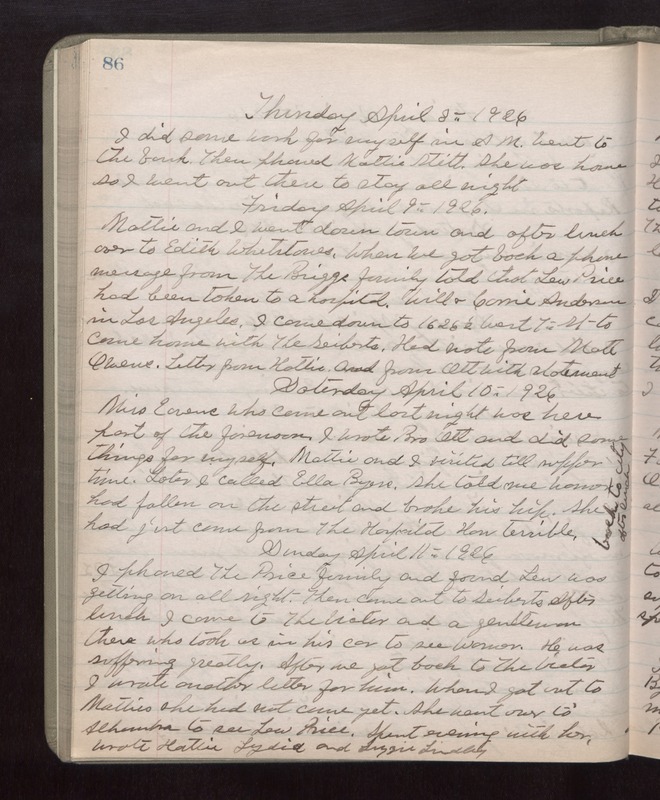 Friday April 9th 1926 Mattie and I went down town and after lunch over to Edith Whetstones. When we got back a phone message from The Briggs family told that Lew Price had been taken to a hospital. Will & Carrie Anderson in Los Angeles. I came down to 1626 1/2 West 7th st to came home with The Seiberts. Had note from Matt Owens. Letter from Hattie and from Ott with statement. Saturday April 10th 1926 Miss Eavens who came out last night was here part of the forenoon. I wrote Bro Ott and did some things for myself. Mattie and I visited till supper time. Later I called Ella Byers. She told me Warner had fallen on the street and broke his hip. She had just come from the Hospital. How terrible. Back to city after lunch. Sunday April 11th 1926 I phoned The Price family and found Lew was getting on all right. Then came out to Seiberts. After lunch I came to The Victor and a gentleman there who took us in his car to see Warner. He was suffering greatly. After we got back to The Victor I wrote another letter for him. When I got out to Matties she had not come yet. She went over to Alhambra to see Lew Price. Spent evening with her. Wrote Hattie, Lydia and Lizzie Lindley.